Hope you’re all having a great week! It’s been COLD lately here in the Northeast. 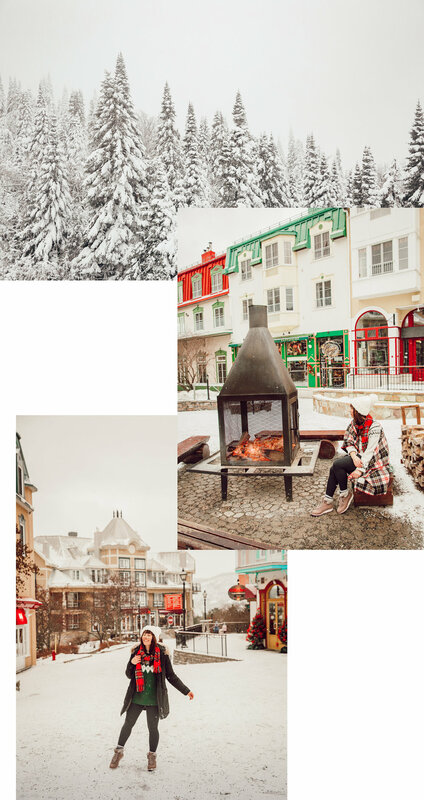 I’m currently bundled up indoors and catching up on some blog posts, like this trip to Canada I took right before Christmas! My friend, Jack, and I took an impromptu road trip north of the border to Québec, to play in the snow and take in all the holiday decor. 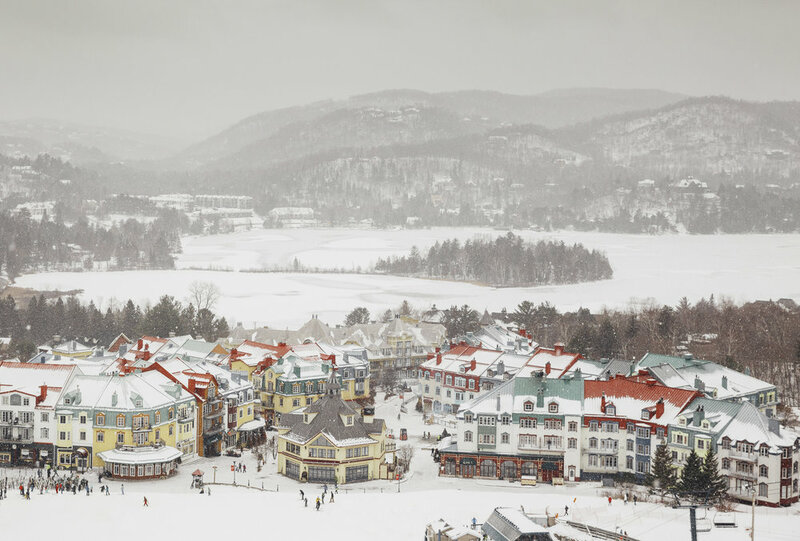 Our first stop was to Mont-Tremblant, a beautiful ski mountain and village tucked in the Laurentian Mountain Range. 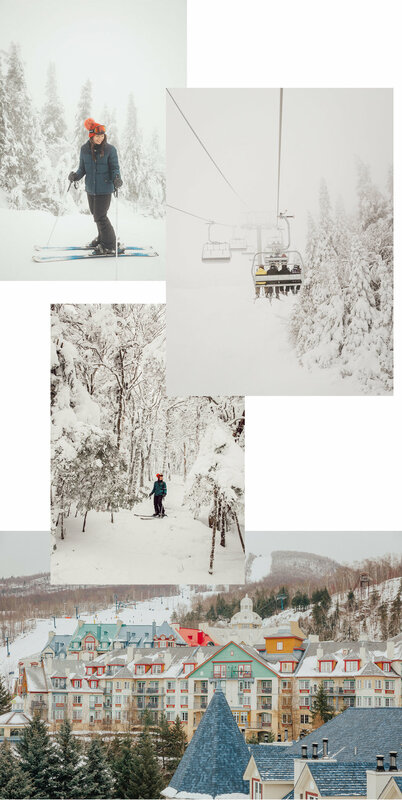 Tremblant is a fellow Ikon Pass destination, and marked my second time (first in Québec!) skiing in Canada. After a four hour drive from the Adirondack mountains, we set about to explore the village and get our bearings for the following morning. When we woke up, we were greeted with a fresh layer of powder and snow flakes falling! With a short ride up the Cabriolet (which in itself is SUCH a fun way to view the village! )., we made our way onto the gondola and up to the summit. It was snowing HARD when we arrived, and the surroundings made for a true winter wonderland. Since this was my first time visiting the mountain, I decided to join a free guided tour. The mountain offers them twice daily, and in my case, I had the guide all to myself! It was a super fun and easy way to get my bearings of the trails. After a full day of skiing, we made our way back down to explore the village by daylight. I loved how magical and festive all the holiday decorations were. It felt like we had been transported onto a movie stage for a Christmas movie. We were so overwhelmed with the beauty of the village that we actually ended up changing our plans to stay another night. In the morning, we had the incredible opportunity to explore the nearby Scandinave Spa Mont-Tremblant before they opened to the public. After touring the grounds, and enjoying the hot baths, I experienced my first polar bear plunge by dipping into the Diable River! I’m not gonna lie, it was excruciating, but it’s all part of the hydrotherapy experience. To read more about the process, check it out here. After our relaxing morning, we had one last stop before returning to New York : Québec City. After my first visit to the city last year, I knew I had to come back to see it in full holiday mode. And it did not disappoint. 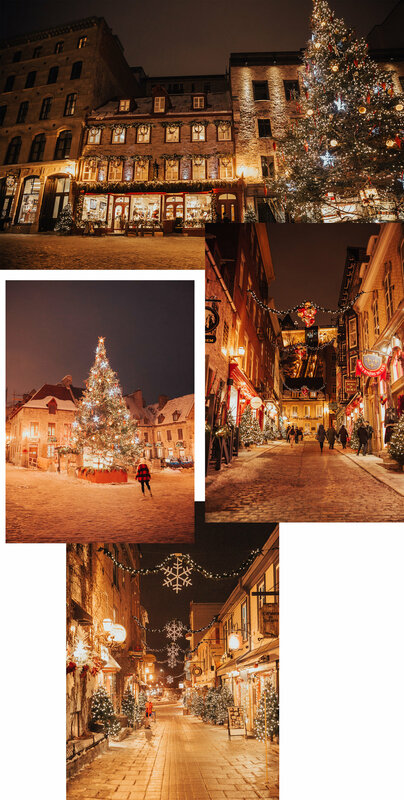 The old streets are so enchanting and everyone was so full of Christmas spirit. It was truly such a fun holiday trip, and I’m so happy I had my friend, Jack, there to share it with! He also helped shoot a bunch of my images on this trip, so please be sure to check out his amazing work. We spent a good chunk of this trip planning out some veryyyy fun trips for this year, so this isn’t the last you’ll be hearing of him! Until next time.